Last month, the annual gaming convention, Gen Con, celebrated its highly anticipated 50th anniversary, which brought with it a host of all-new games and revived classics. 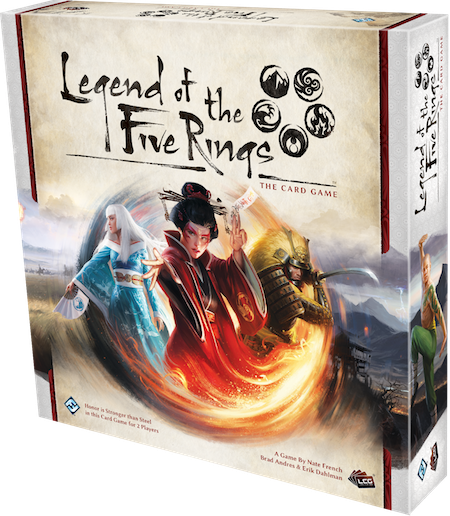 One of the returning games, Legend of the Five Rings: The Card Game, is the Minnesota-local Fantasy Flight Games’ reimagining of a popular collectible card game by Alderac Entertainment Group. Legend of the Five Rings, or L5R as it is known in shorthand, is a samurai fantasy in which the seven Great Clans of Rokugan vie for supremacy while remaining ostensibly beholden to a singular Emperor. At the dawn of the Empire, the first Emperor bestowed upon each clan a unique role in shaping his realm—roles which over time came to define and diversify the clans from one another, even as each shares a common belief in the code of bushidō—the “way of the warrior”—and the concepts of honor, loyalty, and duty that bushidō carries with it. At the time of its license transfer to Fantasy Flight, L5R was one of the longest-running CCGs of all time, having started in 1995 and commanding throughout its 20-year run a strong and dedicated playerbase, whose devotion to L5R was owed in large part to the game’s player-driven, interactive storyline, in which tournament results and player votes had an impact on the flow of the unfolding fiction of the setting. Players would side with a specific clan in this ongoing struggle, and become invested in that clan’s real-world victories and defeats as each would be reflected in some manner as it pertained to the overarching storyline. This dynamic has been successfully retained under FFG, as the new iteration’s inaugural tournament at Gen Con saw the undefeated participants convening to decide whether the Emperor would compel my people, the Unicorn Clan, to abandon their use of a foreign magic known as meishōdō, or reveal its secrets to a loyal few in the Emperor’s service, so that its nature could be studied more carefully. Thankfully, the players pursued the latter option, a decision whose story implications were revealed literally overnight as a new story piece was uploaded to the official site the next day. 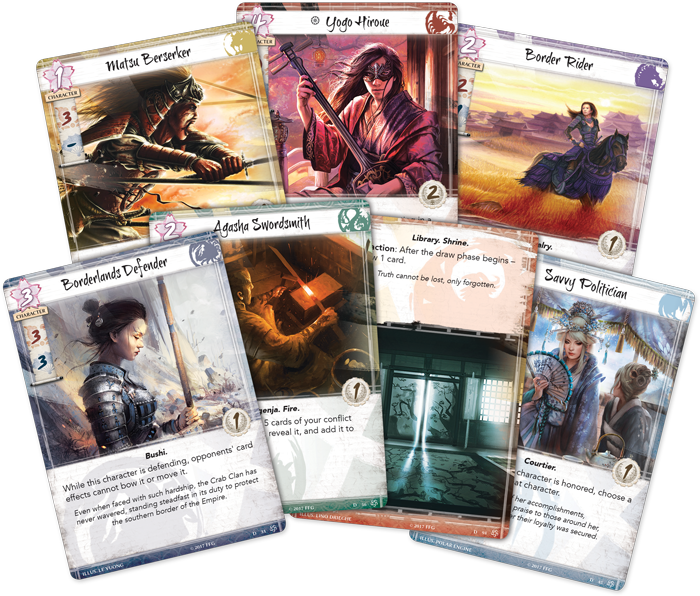 The card game, now another in FFG’s Living Card Game (LCG) library, has elements of characteristically Eastern philosophy built into its core design, as honor, the lifeblood of a samurai, must be carefully nurtured and preserved: if a player ever reaches 25 honor, they win; if they fall to zero, they lose. Each turn, players secretly bid honor, and in doing so elect how many cards they wish to draw in order to gain an edge in the military and political conflicts to come, but those who depend too heavily on subterfuge will quickly find themselves undone by their own shameful ambitions. Even more thematic, though, is the way in which the LCG’s unique fate system evokes the transient nature of life and the resulting need for one to remain stoic and detached from the present way of things. Fate, the main currency in the game, is used to purchase characters and other cards, as in any similar game. However, whenever a character enters play, that character’s controller may also place one or more additional fate tokens onto the character, and at the end of each round, a fate token is removed from each character in play, and characters with no fate tokens are discarded. Thus, a wise daimyō must know how much of her clan’s hopes and dreams—its fate, if you will—she can afford to entrust into each of her subjects. While fans of the previous game and storyline will find that much has changed with the new iteration, what I have seen of each so far has been a clear improvement. While a quality franchise in many respects, the “Old Legend,” as I have come to call it, was not without its flaws. As a product of the CCG boom of the mid-’90s, the game itself was beginning to show its age, particularly in competition with newer games including other LCGs like A Game of Thrones. 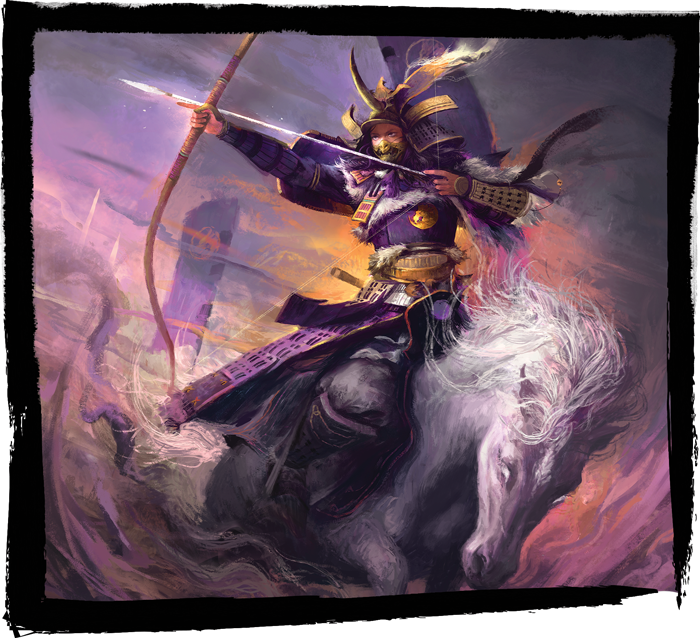 Also, in the wake of a growing Western interest in anime and Japanese culture in general that grew out of roughly the same period, L5R‘s current creators and audience alike have a much firmer grasp of what amounts to an authentic representation of the cultural trappings that provide inspiration for the setting. Legend of the Five Rings: The Card Game releases October 5th, with many game stores hosting a special release event soon thereafter. In the meantime, support for the game has already begun to develop, with rules and fiction available to introduce you to the LCG and the ways of the seven Great Clans. Choose a clan, join a legion of fans online, and make sure your local game store is ready to return to Rokugan!